To improve this process, a file can be automatically downloaded onto the system of the user who receives the file immediately after it is routed. The download process takes place in the background so the user can continue working with Smart Connection while the file is being downloaded. When the user wants to work on the file it is immediately available because it is already downloaded and present on the system. The working of Smart Caching is very straight forward and in fact, invisible: a file is routed to a user and Smart Caching automatically downloads the file onto the system of the user who receives the file. As mentioned above, this all takes place in the background so the user will very likely not be aware that the download is in progress apart from seeing a message that a file has been routed. Before Smart Caching can be used, the right components need to be installed, Enterprise Server needs to be configured and the Content Station Desktop app needs to be running. It is assumed here that this has been done. For more information, see Configuring Smart Caching for Smart Connection. Note: Smart Connection makes use of the Smart Caching feature of Content Station 10 and therefore requires components of Content Station 10. Content Station 10 itself is not needed. 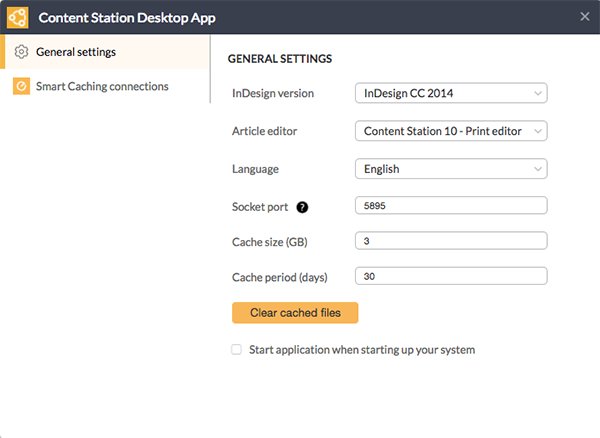 The Smart Caching feature is controlled by the Content Station 10 Desktop app. This application runs in the background and you will see its icon displayed in the System Tray on Windows or in the System Menu on Mac OS X. The app takes care of downloading a routed file in the background, thereby allowing you to continue to work with Smart Connection. 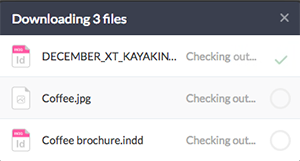 As soon as the file is routed to you, a message is shown by the Desktop app to inform you about this. The file appears in your Inbox and it is downloaded in the background. As mentioned, the use of Smart Caching is practically invisible because all actions take place in the background. However, you will be notified when first using Smart Caching and you will see a message appear at those times when Smart Connection communicates with the Content Station Desktop app (such as when checking-in a layout). How this is done is explained below. You will mainly use the settings to temporarily pause the working of Smart Caching or to disable it altogether. 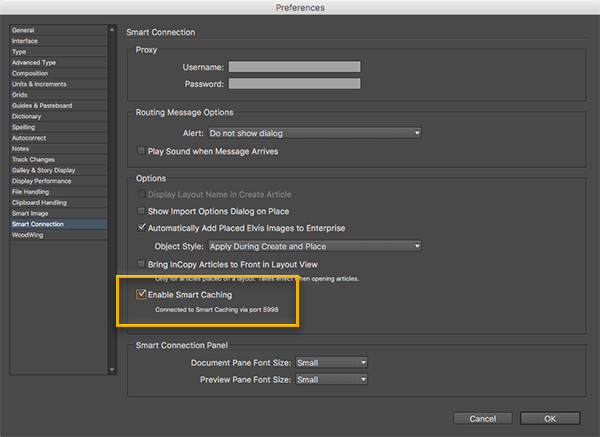 Smart Caching is enabled by default in Smart Connection, meaning that it will use the Content Station Desktop app for retrieving routed files. 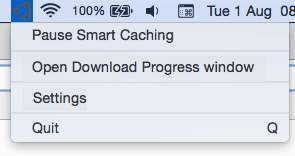 For this to work, Smart Caching should be enabled and not paused in the Desktop app itself. When the system administrator has configured the setting through the WWSettings.xml file, this Preference cannot be changed. 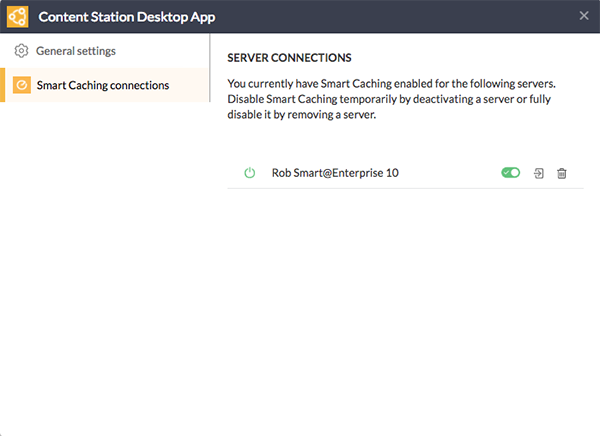 Smart Caching can also be disabled in the Desktop app, but this also affects using Smart Caching for Content Station 10. When first logging in to Smart Connection after the Smart Caching feature is made available for you, Smart Connection will automatically connect to the Desktop app. Note: It is assumed here that the Smart Caching preference is enabled. Note: Disabling Smart Caching through the Desktop app completely disables Smart Caching on the system, including for Content Station 10. If Smart Caching should only be disabled for Smart Connection, do this by using the Smart Connection preference 'Enable Smart Caching' (see above). The window shows all instances of Enterprise Server to which a connection has been made for Smart Caching. 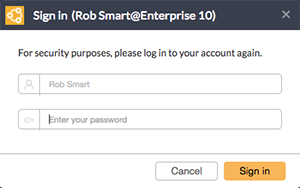 Note: This will be the server with the same name as the one you chose when signing in to Smart Connection. Note: Please ignore the other settings in this window; they are used by Content Station 10 and do not apply to Smart Connection. When Smart Caching was used for the first time, a connection to Enterprise Server needed to be made by logging in to the server. If needed, this connection can be fully removed. Remove the server by clicking the Trash Can icon to fully remove the reference to that server.